The best personal trainer in Dubai, Abu Dhabi or Sharjah – these are terms that people in the UAE regularly search for on the internet when looking for personal trainers at home or local to them. However, how do you define who is the ‘best’ personal trainer in Dubai, Abu Dhabi or Sharjah? In the UAE regular physical training can keep you healthy, active, and productive. Despite the massive campaign by different health consciousness organizations about the endless benefits of exercise, only a few people are indulged in it. The truth is, most people find it hard to keep to a training schedule, because of all the distractions and lack of motivation. Hiring a qualified at home personal trainer in Dubai, Abu Dhabi and other areas in the UAE remains the best option for anyone who is truly interested in getting fit. But how do you choose the right (or best) personal trainer since there are thousands of them out there doing almost the same thing? Here are simple tips to help you achieve success on the road to a fitter, healthier life. What Is Your Health & Fitness Goal In The UAE? Your exercise or training goal is one of the major points that will determine the kind of personal trainer you will hire in Dubai, Abu Dhabi or Sharjah. Do you need a personal trainer to help you lose weight or someone that will provide you instructions about weightlifting? Do you want to go into strength training or you want to get yourself in shape for the marathon? Whatever you do, make sure your trainer is a specialist in what you’re trying to achieve, and they are ready to give you all the support you need to excel. A personal trainer in Dubai for postnatal exercise is very different from a personal trainer in Dubai for Zumba classes. When it comes to the ‘best’ personal trainer in the UAE it all depends on their specialist areas of training and exercise. It is important to find someone in the UAE who knows the science behind physical training, but if they don’t connect with you on a personal level, you are likely not to achieve much. When shopping around for a personal trainer make sure you select someone you can connect with. Find a common interest and try to see if the two of you agree on one or two things. Don’t focus only on the business during the interview, ask for their hobbies, likes, dislikes, and let them tell you part of their story. Some humans connect quickly while others don’t, and no one can explain that. The two of you have to be able to connect easily for things to work. 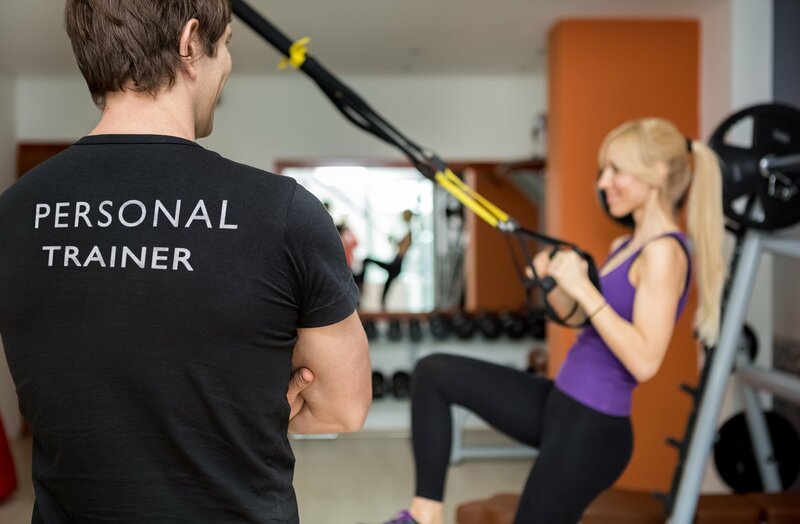 Don’t forget that when you are looking for a personal trainer you are the one doing the hiring – with this in mind meet as many personal trainers as you need until you are happy with one. Getting a certified personal training expert in Dubai or Abu Dhabi is not even open for debate. You want to make sure the person training you has verifiable expertise in their field and is accountable to one or two organizations. Ask the trainer to show you their certification. They should have certifications and certifications for any specialist areas that they offer services for. Pre and Post Natal personal trainers for example are specialist and should be trained in these areas. The same applies for senior fitness in the UAE and those with disabilites or special needs. Hiring a trainer without proper certification is like going to a doctor who is not licensed, it’s too much risk. If in doubt ask to see copies of their training certificates and their liability insurance. There is no better way to find a reliable personal training expert in the UAE than to ask for a recommendation from someone who has used the trainer’s services. As long as the trainer can connect with your personality, the rest should be smooth. So, ask family and friends if they know anyone they can vouch for and see how they can work with you too. A personal trainer referred to you reduces the risk of trust, and can even offer discounts. The UAE personal trainers website also includes client testimonials on each personal trainer profile page. This feedback on an individual basis should help you gauge whether the trainer is right for you or not. The UAE Personal Trainers website takes professionalism seriously. On many other personal training related websites in the UAE trainers are listed who obviously are unqualified or illegal. We never list professionals alongside unqualified trainers both to protect our reputation as a professional portal for personal training services in the UAE and also to protect the reputation of the personal trainers listed on the website. You should be aware that there are fake trainers out there who are only in it for the money. One of the best ways to detect this is when a trainer tells you there is only one way to go about your at home personal training program. An expert trainer must be able to understand your needs, map out a specific program that will work with your body size, and come up with a customized plan. A passionate trainer will learn along with you, to discover new things and find better ways to help you succeed. The best personal trainer in Dubai, Abu Dhabi or Sharjah is a relative term and cannot be applied to a single trainer – a trainer who is best at weightlifting is very different from a trainer who is best at yoga or pilates in the UAE. When interviewing your prospective trainer ask them how many years they have been in the business. Smart practice makes perfection and the number of quality hours spent doing a particular thing is what makes you become an expert. A trainer that has worked on 200 clients who mostly have positive reviews to give is likely to be more experienced than someone who has only worked with 20 people. Experience also matters when it comes to personal needs or if you are suffering from one ailment or the other. You need someone who is gentle, understanding, patient, and ready to work with you. Don’t forget to ask the UAE personal trainer for their fees. If a trainer is experienced they will likely have many clients and charge higher too. Have a budget for your at home personal training in Dubai, Abu Dhabi or Sharjah. This is why you need to interview at least three or four people, compare their details, and choose the one that is most right for you. Women should consider hiring a female personal trainer in Dubai or Abu Dhabi because they are equally as good as their male colleagues and also some women would feel more comfortable working with a female personal trainer in the UAE. As you can see – choosing the ‘best’ personal trainer requires patience. Take your time to find the right person that will connect with you and has all you need to succeed in your personal training sessions, either at home or in your gym. Have a budget and check credentials to make sure you’re not at risk. The UAE personal trainers website takes your personal training needs seriously which is why we only allow professionals to be listed. Finding the perfect trainer to fit your needs is very easy. Whether you need a yoga personal trainer in Dubai or a prenatal specialist trainer in Sharjah you are sure to find the best trainer to help you achieve all your fitness goals.